*The Editor’s Page- “Infusions, Percolations and Macerations" by Luis Ayala. *World Rum News- Summary of rum related news. *Upcoming Spirits Events. *The Angel’s Share- Featuring VooDoo Spiced Rum (70-Proof), Old New Orleans Cajun Spice Rum (80-Proof), Cruzan 9 Spiced Rum (80-Proof) and Koloa Kaua’I Spice Rum (88-Proof). *The Rum Lab- recipe for making a spiced rum. *Spooky Cocktails- great Halloween cocktail recipes furnished by RedRum. *Rum In History- A timeline of what happened in the month of October throughout history. *Bartender's corner- Dr. Ron A. Ñejo looks at conduct behind the bar. 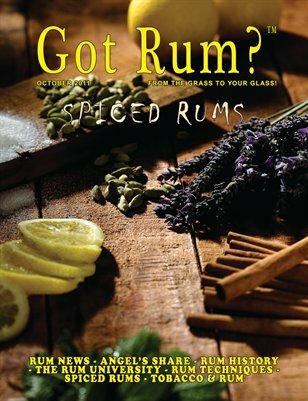 *Featured Rum Book- written by none other than our publishers, Luis and Margaret Ayala. *The Rum University- This month we look at the *Classifications of Rum- Part 7. *Rum Techniques- Covering the Organoleptic Assessment of Rum- Part 7. *Coming Up- A sneak preview of what will be covered in November and December. *Tobacco and Rum- Featuring Davidoff Puro d’Oro Eminentes cigar and Brugal Añejo rum.